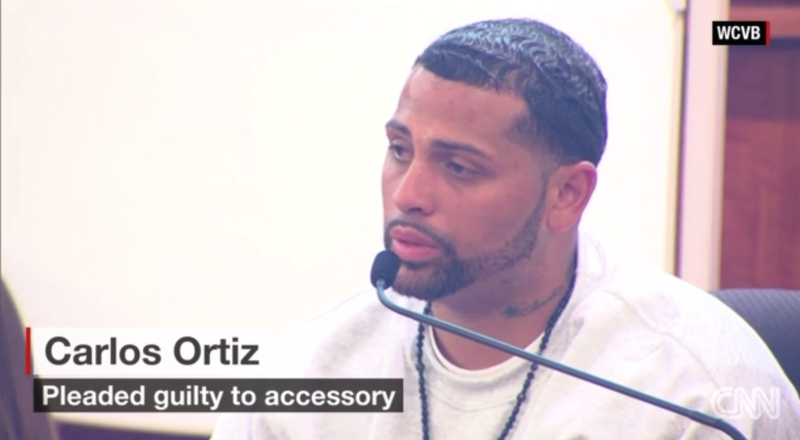 A co-defendant of former NFL player Aaron Hernandez took a plea deal for his part in the 2013 death of Odin Lloyd and was sentenced Monday, CNN reports. Carlos Ortiz, 30, changed his not guilty plea and pleaded guilty to being an accessory after the fact for helping Hernandez after the fatal 2013 shooting. In return, prosecutors dropped a murder charge, and Ortiz was sentenced to four-and-a-half to seven years in prison, finally bringing a conclusion to proceedings related to Lloyd's death. "Odin Lloyd was a young man who had his whole life ahead of him," Bristol County, Mass., District Attorney Thomas Quinn said in a press release, according to CNN. "He did not deserve to fall victim to the brutal and truly senseless murder committed by Aaron Hernandez and covered up by his co-defendants." Hernandez, Ortiz and Ernest Wallace were all initially charged with murder in the death of Lloyd, whose body was found riddled with bullets June 17, 2013, CNN notes. Lloyd was last seen alive in a rented car with the three men around 2:30 a.m. that day. Surveillance footage showed the vehicle pulling into a park moments before Hernandez shot Lloyd multiple times, prosecutors noted. A marijuana blunt with Hernandez's DNA was found near Lloyd's body, as well as a white towel that Ortiz was seen wearing in surveillance footage earlier the evening before. According to CNN, the exact motive for the murder is still not clear. Hernandez was the first to be convicted, in April 2015, and he was sentenced to life in prison for first-degree murder. He is also still awaiting a Boston trial for the double homicide of Daniel Abreu and Safiro Furtado, both of whom he is accused of murdering after one of the men bumped into him at a Boston nightclub, causing him to spill his drink, CNN reports. Wallace was acquitted of murder in May, CNN notes, but was found guilty of being an accessory after the fact and was sentenced, like Ortiz, to four-and-a-half to seven years in prison.